Management is responsible for the management, and if any mistake or errors take place, McDonald’s need to manage it staff, chef, and especially the team for cleanliness and the team take feedback from the people. 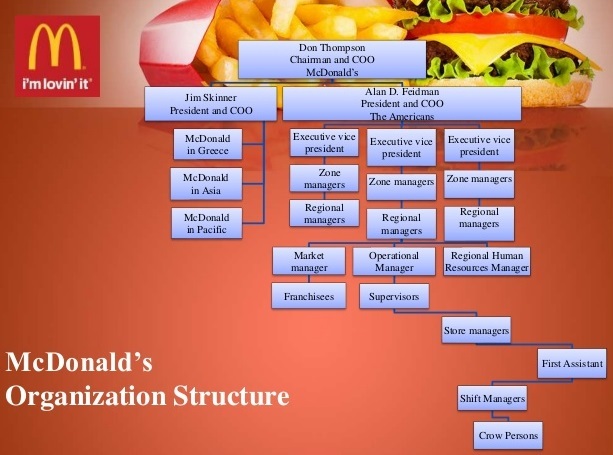 Effective management strategies are needed, McDonald chef should be changes and they should bring innovation in the menu, other brands have many things in menu, however, McDonald’s is following its same menu from years; McDonald’s should hire expertise or new experienced chef who can do innovation, and can introduce new products in the menu. Marking team is responsible for the marketing strategies, because competitors are doing marketing better than McDonald is. Finance department is responsible for the issue in prices, they have to set or manage the prices, according to the prices of competitors. In case of mismanagement or conflicts in staff, HR dept. is responsible. The designed strategies should be implemented or execute in all McDonald’s overall the world, because McDonald’s is globally recognized restaurants and improvement is needed, everywhere around the world. Implementation is the important application, if plans, strategies are made properly, however, there are no implementation, then there is no use effective strategic planning. In case of McDonald’s, new strategies need to be implemented. If changes take place in the existing menu, and chef are changed then plans should be follow accordingly, prices should be reasonable, staff and chef should be given proper training that how to deal in kitchen and customers. McDonald’s should implement HR strategies and strategies vary to finance deportment, staff need to mange by HR department, example, and wages should be given properly, and there should be incentives and rewards after proper appraisal system. The action or strategies need to implemented for the cleanliness staff, as McDonald’s is famous for its clean open kitchen, so there should be in time, proper check by the management team that all riles are implemented or not. As with the changing in the food industry and growing number of restaurants and food items every day, McDonald’s need to focus on its current situation around the world, their menu should be improved in quality, taste and number of products or items. For the consumer point of you, there is better thing to eat than McDonald’s, however, improvement in menu and prices should be follow, McDonald’s should introduce better food item than its competitors, example, variety of fries, burger and sandwiches should be there. The customer of modern age, are well aware of everything related to food, so strategies should be made, that can persuade customers, and quality, clean food should be given to people.